If you have been on your sick-bed for days and days and THEN you decide you want to start treating yourself naturally, it’s likely that you won’t see much improvement. To really get the full benefit of herbs or homeopathic remedies you need to be in tune with your body and when you start, I’ll repeat that, start to feel run down or start to feel sick, you should immediately begin whatever remedy you are choosing to use. Does this mean that herbs cannot heal if not started right away? Of course not. Elderberry and other natural treatments have been known to work even up to the point of death or at the 11th hour. The point is this, don’t wait till you are on your sick-bed to treat yourself. Pay attention to your body, listen to it’s whispers, and take care of yourself before you get sick. The ideal time to start a remedy is right away! If you are expecting a natural remedy to make you feel better or heal your underlying cause of sickness without you having to change anything about your lifestyle, well that’s like trying to slap a band-aid on a gaping wound. Whenever sickness strikes there are a few things YOU can do right away to help your body fight it off better. I cover this in depth in my Preventing Sickness post, but I’ll break it down shortly. First and foremost, the thing that you should get rid of immediately is sugar. Sugar makes your immune system crash for 30 minutes to 5 hours right after you ingest it. That is just asking for trouble. If you are filling your body with sugar throughout the day, or junk food, or lots of dairy, your body is going to have a really hard time resisting the illness and letting any natural remedy work. If you are not adequately hydrated or getting enough rest your body will also not heal quickly. 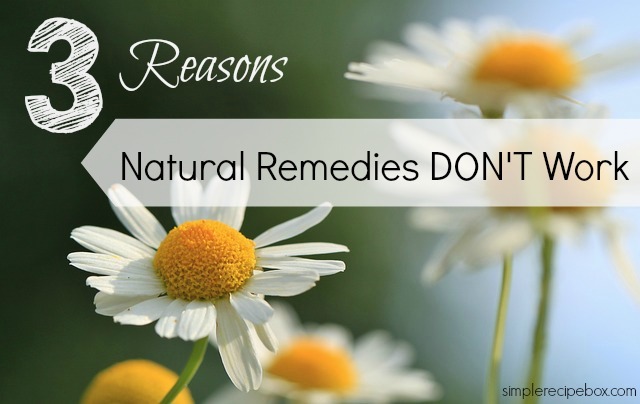 No amount of natural remedies can make up for an unhealthy lifestyle. Your body is a magnificent machine. All parts of your body were meant to work with each other. Too often we look at the symptoms and want to quickly make those go away, but that is only part of the story. The symptoms are merely a sign of the underlying cause. Drugs that treat only the symptoms will not address the bigger issue in your body and you’ll most likely end up sick again. You need to look deeper than symptoms and have a lifestyle that promotes healing. We live in a fast paced world. We also have very little patience. Being able to access anyone at any given time of day or night or search any information on the planet with a few keystrokes has made us a very impatient society. Deep down healing takes time. Let’s take a cold for instance. You wake up with a head cold. Your head aches, your body aches, you have chills. You know that if you reach for that Tylenol or Motrin all that pain will magically disappear. But what about your cold? Did the Motrin heal the cold? What would happen instead if you started an herbal remedy like elderberry, or you started taking doses of colloidal silver or you started a homeopathic remedy? Well, you would have to rest. You would have to watch what you ate. You wouldn’t immediately FEEL better. Often times you start feeling worse before you get better. You might have to miss school or work. You would have to drink broth and good water and continue on the natural remedy for a few hours or a day probably before getting relief. 8 times out of 10 (I’m being conservative here) if you did that, your cold would be gone. Not masked, but gone. Treating the whole body takes time, but it is not wasted time. If you are treating the underlying cause and changing lifestyle habits you are truly getting “well”. You often have to give the natural remedies more time to work. That being said, please be wise. Never let a small child maintain a high fever and never use medicines, natural or otherwise, without consulting your doctor or Naturopath. There are some cases when antibiotics or surgery or other “conventional” medical treatments might be warranted, and I’m so grateful we have access to great medical care for those reasons. Listen to your gut and never be reckless with your health or with others. If you’d like to know what we do when someone gets sick, check out my Protocol for Fighting Cold and Flu post and please, share any other tips you have in the comments!